PlexiDor Extra Large Dog Doors are chew proof – GUARANTEED. We have applied many of the features from our commercial kennel doors used by military and police worldwide to bring you a virtually indestructible dog door. PlexiDor’s patented panels are saloon style and do not require costly replacement flaps. The hardened aluminum frames come in a silver, white or bronze finish to coordinate beautifully with your appliances, interior walls or hardwood floors. Each Medium, Large and Extra Large PlexiDor includes a cylinder lock, key and steel security plate. The door can be locked every night and the steel security plate can be attached while you’re away for an extended period of time. PlexiDor Performance Pet Doors are extremely energy efficient. Each time you open the door to let your dog out, your heating and cooling escapes. 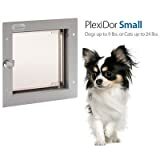 Installing a PlexiDor Dog Door can save you money. On average, homeowners have reported an annual savings of 10% off their energy bill. The wall units can be installed into stud, brick, block or cement walls up to 12 inches thick. Each wall unit includes an aluminum tunnel that connects the interior and exterior frame. The tunnel materials ensure a professional fit and finish that provides a quality appearance for your home. The tunnel will not rust, has no sharp edges and is easy to clean. The PlexiDor Extra Large Units are designed for dogs weighing up to 220 pounds. This size is best for breeds such as Great Danes, St. Bernard’s, Borzois, Old English Sheepdogs, Newfoundland’s, Irish Wolfhounds and Great Pyrenees. PlexiDor Performance Pet Doors are manufactured in the U.S.A. and come with a 5 year limited residential warranty.